The interferometer is particularly well adapted for showing very slight differences in the paths of the two interfering pencils, such, for instance, as are produced by inequalities in the temperature of the air. The heat of the hand held near one of the paths is quite sufficient to cause a wavering of the fringes; and a lighted match produces contortions such as are shown in Fig. 4C>. The effect is duo to the fact that the density of the air varies with the temperature; when the air is hot its density diminishes, and with it the refractive index. 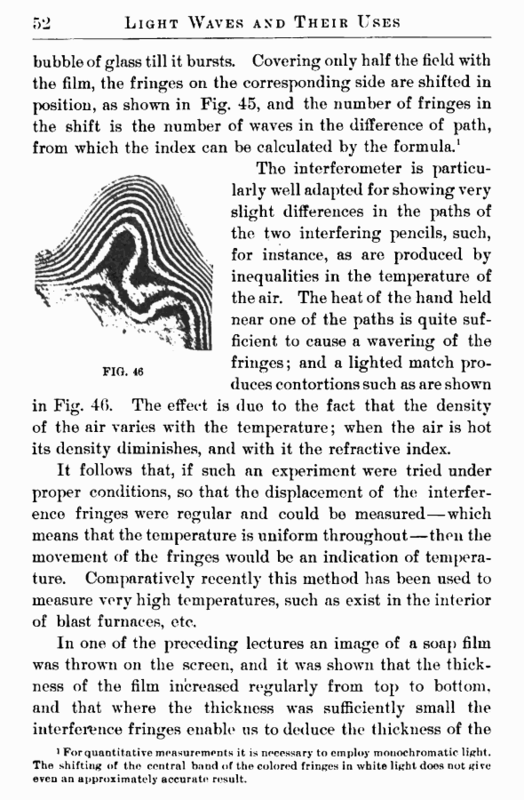 It follows that, if such an experiment were tried under proper conditions, so that the displacement of the interference fringes were regular and could be measured—which means that the temperature is uniform throughout—then the movement of the fringes would be an indication of temperature. Comparatively recently this method has been used to measure very high temperatures, such as exist in the interior of blast furnaces, etc. i For quantitative measurements it is necessary to employ monochromatic light. The shifting of the central band of the colored fringes in white light does not give even an approximately accurate result. film. It was also shown that at the top of the film, where the thickness was very small, a black band appears, its lower edge being sharply defined as though there were here a sudden change in thickness, as illustrated in Fig. 47. Now, this “black spot” may be observed sufficiently long to measure the displacement produced in interference fringes when the film is placed in the interferometer. 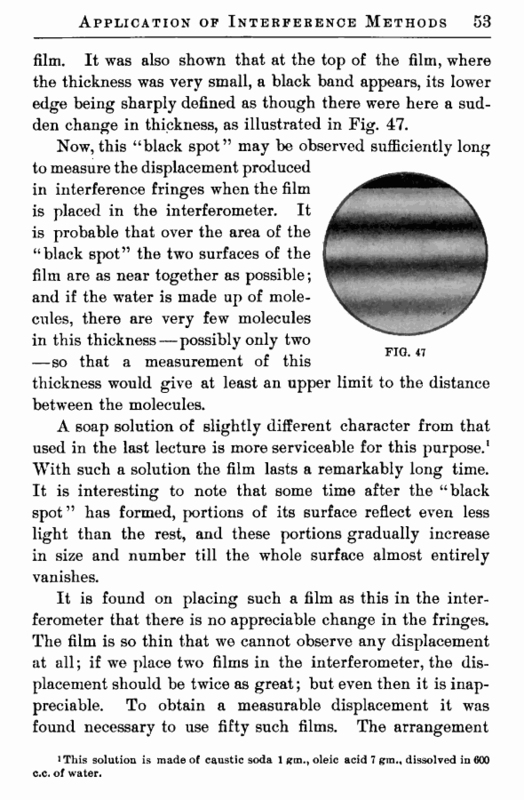 It is probable that over the area of the “black spot” the two surfaces of the film are as near together as possible; and if the water is made up of molecules, there are very few molecules in this thickness—possibly only two —so that a measurement of this thickness would give at least an upper limit to the distance between the molecules. A soap solution of slightly different character from that used in the last lecture is more serviceable for this purpose.1 With such a solution the film lasts a remarkably long time. It is interesting to note that some time after the “black spot” has formed, portions of its surface reflect even less light than the rest, and these portions gradually increase in size and number till the whole surface almost entirely vanishes. 1 This solution is made of caustic soda 1 oleic acid 7 grmM dissolved in 600 c.c. of water.